IPL 2019: Sam Curran's hat-trick helps Kings XI Punjab beat Delhi Capitals by 14 runs: Kings XI Punjab defeated Delhi Capitals in a nailbiter by 14 runs at Punjab Cricket Association IS Bindra Stadium, Mohali. Shreyas Iyer-led DC registered their third win in the Vivo IPL 2019. Young lad Sam Curran claimed hat-trick. He took four wickets in 2.2 overs and conceded just 11 runs. 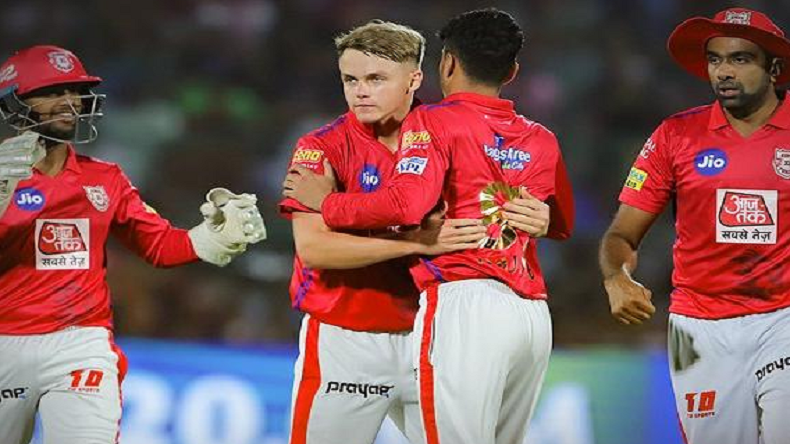 IPL 2019: Sam Curran’s hat-trick helps Kings XI Punjab beat Delhi Capitals by 14 runs: Kings XI Punjab registered third thumping victory in the Indian Premier League (IPL) over Delhi Capitals by 14 runs. After two-day double-header only one match was played On Monday, which was snatched by Punjab in the death overs as seven wickets of Shreyas Iyer-led Capitals fell for just eight runs. All credits to Sam Curran who wrecked havoc in Delhi. Chasing down a target of 166, Delhi lost its first wicket on the first delivery of the second inning. Prithvi Shaw was dismissed by Ravichandran Ashwin without troubling the scorer. After that opener Shikhar Dhawan and skipper Shreyas Iyer took the score to 61. But Hardus Viljoen struck in the eight over and sent Iyer back to pavilion on 28 off 22 balls. The third wicket fell on 82 when Dhawan was departed by Ashwin. Rishabh Pant and Colin Ingram propelled the score to 144 in the 17th over. It looked Delhi would easily chase the score but rival bowlers tightened the noose and departed five players on four runs including Pant, Chris Morris and Colin Ingram. At one moment team needed 23 off 18 balls but in last over Rajasthan needed 15 runs. Skipper chose Curran to bowl final over who claimed two wickets in the first two balls and completed hat-trick. Pant remained highest scorer for his team. He made 39, Colin Ingram scored 38, Dhawan made 30 and skipper Iyer scored 28. For Punjab, Curran picked up four wickets while Ahwin and Shami claimed two each wicket. Batting second, Punjab did not get a decent start. First wicket fell for 15, second wicket for 36 and third for 58 runs. The team manages to set a target of 166. David Miller scored 43 off 30 balls, Sarfaraz Khan made 39 off 29 balls and Mandeep Singh scored 29 off 21 deliveries. For Delhi, Chris Morris took three wickets while Kagiso Rabada and Sandeep Lamichhane picked two each. Curran was named a player of the match for his brilliant bowling. Both the teams had earlier won two each game out of the three. Punjab defeated Rajasthan Royals and Mumbai Indians while it lost to Kolkata Knight Riders. Delhi beat Mumbai Indians and Kolkata Knight Riders while it lost to Chennai Super Kings.